Home Ideas About Creativity Am I Creating Art? Art is an extension of the way we each feel about the world. Emotions are what make us human. The fact that no matter how different our backgrounds, we all grieve, feel joy and show anger, is something that connects each of us on a deeper level – it bonds us together in this human experience. It can be so important to feel through every experience, good or bad. And negative emotions can be just as beautiful as the positive. Without the bad there is no good. So, when we put what we feel into what we create, it can be cathartic in the release, and also very relatable to our audience. No matter how much differently someone interprets your images when looking at them, they feel something, and to me, that’s what art is. Inner Brick’s post got me thinking about emotions and how we represent them in our toy photography. And in that, if art is simply the visual expression of emotion, am I creating art? While I recognize we all approach creating toy photos differently, the question of whether or not I personally am creating art is important to me. Art is an individual expression that can be absorbed by the masses. Like I said above, while our walks of life are all different, with patience we can understand each other’s struggles on an emotional level. In this, I believe art can connect us, and therefore, no matter how personal your art, it can also be a an important, perhaps therapeutic, experience to share it publicly. While not an idea that can easily be put in a box, I feel the line in photography as art lies between simply photographing an object or scene versus attempting to convey a story or idea. So, in light of all this, am I creating art? I hope so, I’d like to be, and I tend to think that if someone is intentionally expressing themselves through the act of creation, that they are, in fact, making art. Toys in themselves can serve as iconographic objects. They’re not real people, places or things, but simplistic versions of such – abstractions of reality, if you will. In this, I believe toys are the perfect medium for creating visual representations of memories and emotions, which are abstractions of reality within themselves. Toy photography as art may not quite be mainstream yet, which can make it hard to define, but no art was, in its early days. You have to push forward, no matter your medium, to be accepted artistically. So push forward I will. A weighted question for sure – but what is your definition of art? And is it your aim to create art in the toy photos you make? Let us know in a comment below. If it helps any, from my perspective, there is no question you are creating art. I like to look at art as seeing the world in a new light. A new view, a new perspective. A fresh look at something mundane – something that was passed over and now captivating. 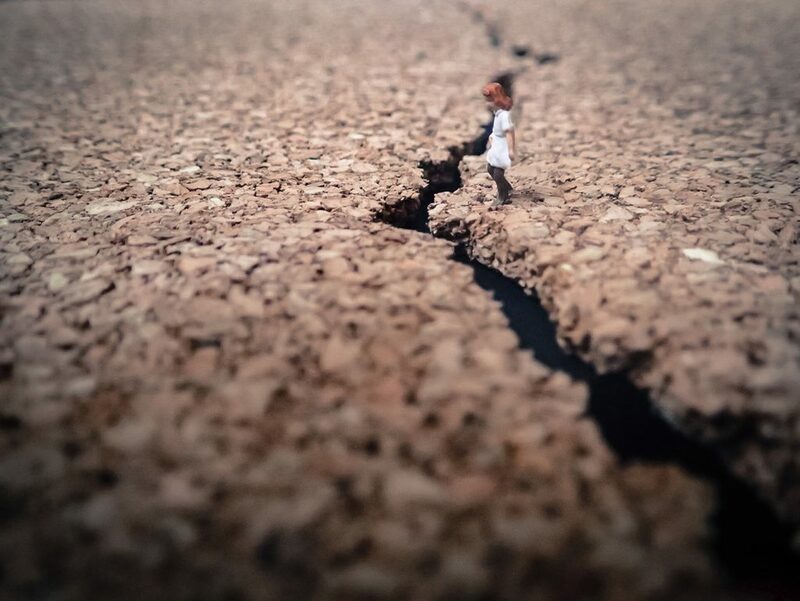 Toy photography exposes the depth of that perspective. A simple crack on the ground becomes a cavernous edge – something scary and something to question. I think this is my favorite part of toy photography; being down in a whole new world with a totally different perspective – the toy perspective. The creativity at this level is unique. Taking a macro picture of an insect doesn’t tell a story like a toy. The toy artist has to present it in such a way to provoke a thought. I also feel there is a distinct art to making toys. A lot of thought and design went into creating the toys we use. The toy designers are artists too. It is definitely an art to make a scene come alive. 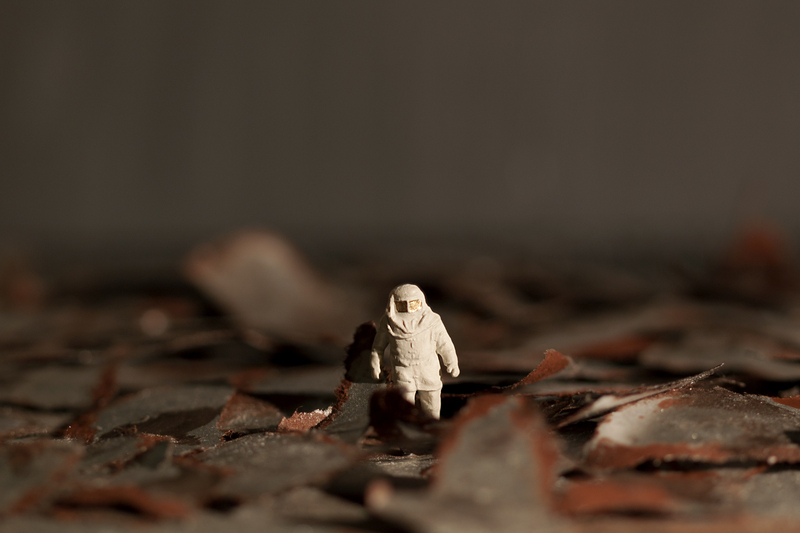 A toy photographer awakens the life of an inanimate object and creates a new reality where perspective blossoms. I adore your last line here and agree with everything you’ve said. Thank you for your insightful comment. ‘A toy photographer awakens the life of an inanimate object’ – I give a slight rewording of this when trying to explain simplistically what I’m aiming to do with my photos. Nicely put. Jennifer I have no doubt that YOU are creating art, but I don’t think ALL toy photography is art. It’s interesting that you bring this up since this weeks Lens Work podcast was on Art Making. His premise was that photography isn’t art until you create something with it beyond a digital file or a film negative. You need to make a presentation for your work. He was open to the means of presentation; framed print, book, whatever. But until you have made that final leap it was just a photograph. Also I think Amy made a good point on the IG feed. Some toy photography is really just product photography. Sometimes its pretty straight forward (figure on a white background) but sometimes it masquerades as art by being technically amazing. But really, it’s only intention is selling more toys. Great post and excellent food for thought! Thank you. And I agree that not all of it is. I think you have to create something with the intention of art, or it has to later be framed as art because of its narrative or emotional merit (in this second part of the statement I’m thinking of Marwencol who didn’t create his toy photography intentionally as art). I haven’t listened to the podcast just yet – but I intend to. However, do you think presentation as art could include a digital platform, or does it need to always be a physical embodiment? I’m of the mind that any regular person, not commissioned by a company, is not intending to create advertising work. Sure they might be showing off their cool toy and that might lead to more sales, but I don’t believe that’s their intention. Whether it’s art is a whole other story of course, as there’s a whole world in between product photography and art, but on occasion, a figure posed on a white background, depending on the figure, the lighting, etc. could potentially make a statement. Jennifer I recently went to our local Art fair. You know one of those large events where galleries show off work to sell. My biggest take away was that yes, presentation does matter. And if you want your work to be seen as art then you need to present it as such. Context does matter. Work shown in a digital form on line is not art. Why? Because on line is not about art but about selling and sharing. Also we consume media online so quickly, that there is no time to ponder the work as one needs to ponder ‘art’. At least if you want your work seen as art, their better be something there to ponder. Layers to reward the viewer for their extra effort. If you as an artists create a digital platform for your work, say an app or some sort of digital delivery system, then that is a form of Art. Again, the context is key. Thanks Shelly for your views on this. Context by far matters. I don’t like saying that work presented digitally is not art. I think it is art very much so. Will is be accepted in the fine art world? Currently, likely no. But it does of course depend on how it’s presented. A photographer who displays their work in a museum via a projector, may never print a piece in their career. But then of course there needs to be reason to why they present their work via projection, and that leads us back to context.